Your products and services reaches the customers efficiently only through a good brand name. Now you can establish a unique brand identity with the custom single function pedometer. This free giveaway with the brand imprint and logo is a utility gift. Hence people will use it quite often. 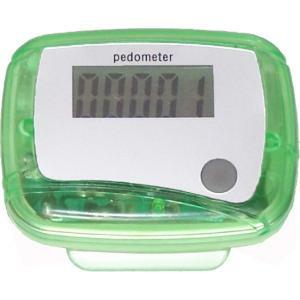 The personalized single function pedometer has a large easy to read display screen that shows the steps counted up to 99,999. You can imprint the brand logo and name on to the front surface of the green promotional single function pedometer.